PROLIM is a sponsor of the Annual Technology Conference, hosted by the U.S. India Chamber of Commerce Dallas-Fort Worth, on Friday, May 11th. The conference will be held from 10 a.m. to 5:30 p.m. 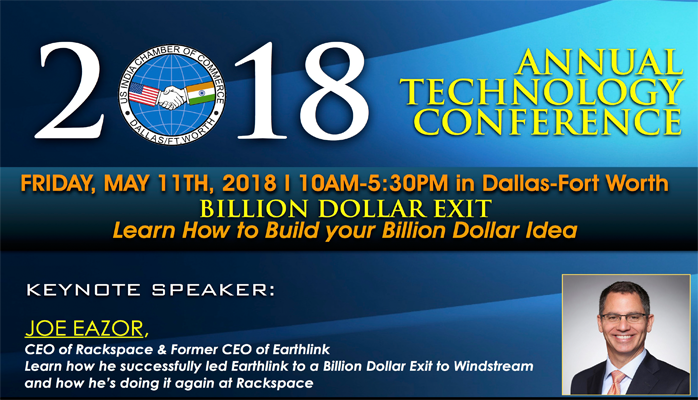 The keynote speaker is Joe Eazor, CEO of Rackspace & former CEO of Earthlink, who will be speaking on building a billion-dollar idea. Eazor successfully led Earthlink to a billion dollar ext and is in the process of doing it again at Rackspace.